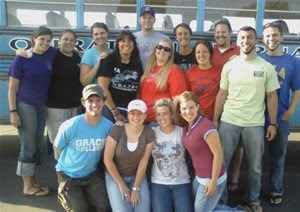 Members of the summer Operation Barnabas teams, organized and directed by CE National, began their training today at the Norwalk Grace Brethren Church in Norwalk, California. Operation Barnabas teams are developed to give growing Christian senior high youth such a thirst for ministry, that upon their return, they will have a greater desire to serve Christ in their lives. At the end of the summer, each “OB” member will have experience with sharing his/her faith, puppets, music, clowning, drama, public performance, testimonies and team relationships. He/she will have learned forty verses of scripture, been a part of a discipleship group, studied a book of the Bible, and done numerous manual chores. Each young person also receives a personal evaluation from leaders while having an opportunity to learn about the joys of serving in local church ministries. He/she will know what it’s like to sleep on both a floor and a bed … eat church carry-in dinners and McDonalds … work in inner-city as well as rural settings. Although some teams could be as small as 20 members or as large as 45, the ratio of adult leaders to students is 1:5 to encourage quality training. To learn more, including the opportunity to sign up for regular e-mail updates from the teams as they travel, click here.